These are on a small(ish) compact shrub (about half a metre in height and sprawling one metre wide). The first flower opened on Tuesday and today there are four blooms on it with about twenty buds ready to spring into action. I love these shrubs, I’ve had a few of them attacked by aphids and have been diligently spraying these bugs off whenever I saw them and a quick check today and the Camellias are bug-free (Yay!). How do I care for them? Regular watering (its been daily watering during our summer heat), checking for bugs and spraying, all got some extra compost a week ago and regular fertilising with special fertiliser for Camellias. And of course they all have a generous layer of mulch around them. That’s it. They seem to be pretty hardy because they are all beautiful, healthy plants. 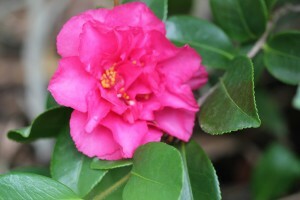 I love camellias and I have a couple of sasanquas that bloom in autumn. Yours are beautiful. Enjoy! Who they are blooming!!! It was just Wednesday they were buds!! They look so beautiful and to see your garden in full bloom must be such a wonderful sight!! Enjoy your beautiful Camellias!! I will not be bored by them, I love camellias and can only see them in gardens such as yours. Thank you Donna – thats so sweet of you! Hi Christine, Camellias in Autumn now that is novel. Ours will start to bloom in about four weeks time, but its Spring! That’s when they are supposed to bloom. Looking for a sweater when its 23c phew! that is a heatwave, we have to find a shady spot in the garden with that kind of heat. I saw a guy a couple of days ago out jogging with only a pair of those 70s style shorts on, it was a blistering 11c, now even my seven year old grandson thought that was crazy. Hi Alistair – Amazing how different our climates are and the human response to weather is really interesting . Camellias blooming in spring … is that the norm in the UK? Here is South Africa they are Late Autumn / Winter bloomers. When I read your message I though that maybe I was very confused (and my Camellias were perhaps confused too), so I checked on the website of the USA Camellia Society and they say “Camellias bloom when few other plants do — in late fall, winter, or early spring”. So now I am wondering if this is different in the UK because your climate is so different to ours? I still find Blotanical so amazing; as I’m waiting for the snow to melt and Spring to begin, you’re reaching for warmer layers! 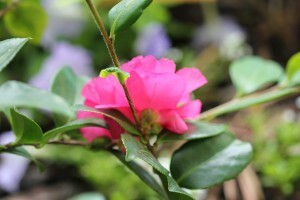 Thanks for the post on camellias; I love them, used to grow them but moved to a climate too cold for them! Love them! !